X-Men vs. Street Fighter is an arcade game released by Capcom in 1996. It features characters from the X-Men franchise and characters from the Street Fighter game series. It was the first game to blend a tag team style of combat with the well-known Street Fighter gameplay, as well as incorporating elements from Capcom's previous fighting games in the Marvel Comics franchise. It was also ported to the Sega Saturn in 1997 and PlayStation in 1998. However, the tag team system was omitted from the PlayStation port due to memory limitations. 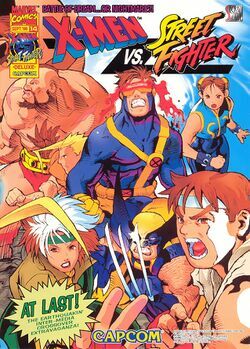 X-Men vs. Street Fighter uses a system similar to the style developed in Marvel Super Heroes, and adds the tag team gameplay feature. Instead of picking one character, a player picks two. The starting character can then tag the waiting one in at any time, which activates the "Variable Attack"; the incoming player will jump in with an attack and taunt briefly. During their taunt, they are vulnerable to counter attack. There are other ways to bring your other character in; the "Variable Counter", which replaces the Infinity Counter of Marvel Super Heroes, breaks your block to bring your teammate in with a counter attack at the cost of a level of super meter. Also, the "Variable Combination" is a two-character super attack which costs two levels, and will switch your character as long as neither character gets hit during their super moves. In order to win the match, both characters in the other team must be defeated. The X-Men characters come largely unchanged from X-Men: Children of the Atom and Marvel Super Heroes, with the exception of Rogue, Gambit and Sabretooth, who were new to the series. The Street Fighter characters used their Street Fighter Alpha forms and their moves were given upgrades to match the larger-than-life atmosphere of the Marvel games (for example, Ryu's Hadouken is much larger than it is in other games). Due to insufficient beta testing, every character in this game has at least one infinite combo. Akuma returns as a "hidden" character to the game, although no code is needed to access him, you simply press up at the top of the character select screen. This page was last edited on 17 May 2016, at 18:26. This page has been accessed 55,079 times.